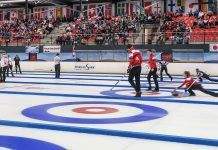 The playoff teams have been decided and four teams are in the running to be crowned U18 curling champions of British Columbia. 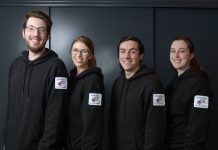 The 2019 BC U18 Curling Championships started at the Juan de Fuca Curling Centre on March 12 and conclude tomorrow (Sunday, March 17). Looking for the U18 boys’ title is Team Sato (Hayato Sato, Joshua Miki, Dawson Ballard, Troy Chong), who recently won gold for BC at the Canada Winter Games. They will play against Team Colwell, representing Vernon, Kamloops and Invermere. The team features skip Erik Colwell and is rounded out by Mitchell Kopytko, Ben Morin and Tyler Powell. Team Colwell defeated Team Deane from Tunnel Town, Duncan and Nanaimo in today’s semi-finals with a score of 5-4. Team Deane, with Connor Deane, Mack Ellis, Troy Cowan and Sam Husdon were awarded the bronze medal. Looking for the U18 girls’ title is Team Buchy and Team Taylor. Team Buchy, representing Kimberley Curling Club, features Kaila Buchy, Katelyn McGillivray, Hannah Lindner and Arissa Toffolo. The Taylor team from Royal City and Tunnel Town curling clubs features Jensen Taylor, Meredith Cole, Keira McCoy and Chelsea Taylor. Team Taylor defeated Team Douglas from Port Alberni, Parksville and Duncan in today’s semi-finals with a score of 6-5. The team of Rebecca Douglas, Brooke Reintjes, Michaela Morrill and Delaena Reintjes was awarded the bronze medal. 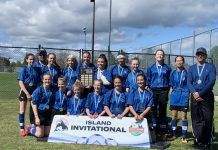 The winning teams will go on to U18 nationals, which take place from April 2-7 at the Glen Allan Recreation Complex in Sherwood Park, Alberta.